A new government-wide military family assistance program was announced today by the White House. In making the announcement, President Barack Obama noted it is an "unprecedented commitment" to military families. The President noted that in his recent trip to Afghanistan last month, he spoke to troops and asked what he could do to help support them. "Without missing a beat, they looked me in the eye and they gave me their answer. It wasn't about more equipment. It wasn't about more resources on the battlefield. In fact, it wasn't about them. "They said, to a man, 'Sir, take care of our families. If we know our families are all right back home, then we can do our jobs.'" The President pointed out that America's service members and military families have done everything the nation has asked of them during this decade of war, and reminded us that the nation must now serve them with the same unfailing support. The White House today released the results of an almost year-long, government-wide study of military family support, titled, "Strengthening our Military Families: Meeting America's Commitment." The new program proposes to integrate mental health services into primary care, and accelerate efforts to prevent suicide among service members. There will also be enhanced efforts to protect military families from unfair financial practices, to address homelessness among our veterans (for which the President called for "zero tolerance" amid thunderous applause) and housing security, and to ensure availability of substance abuse prevention, treatment and recovery services for veterans and military families. Additional resources will also be devoted to employment opportunities for military spouses. Of the roughly 700,000 spouses in DoD, approximately 77 percent have expressed a desire to work. An example of the type of military spouse employment support that is envisioned is the Army Spouse Employment Partnership program, which has signed a statement of support with 57 Fortune 500 and Fortune 100 companies. Since 2003, these companies have hired more than 84,000 Army spouses. DoD plans to extend this program to Navy, Marine and Air Force spouses. Other government agencies will educate corporate America on the benefits of hiring veterans and military spouses, encouraging them to do so. The major focus on military children will be ensuring that additional child care resources are available. There are currently 200,000 children in the DoD child care system, and a shortage of 37,000 spaces. Additionally, a number of departments are working together to increase availability of child care options. Service members and their families are encouraged to read the entire report to learn more about the new military family assistance program. 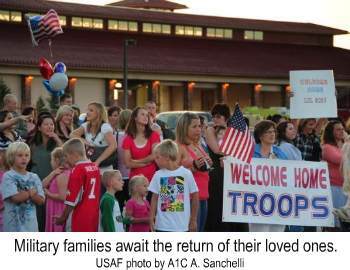 Return from New Military Family Assistance to Home.